Jesus, thank God Damon shaved. It was good to see the Indians' slumbering bats awaken with a bucket-of-icewater start last weekend against the Royals. Maybe the Tribe just needs to ink more aging outfielders if that's what it takes to rouse the offense. What's Cory Snyder doing these days? 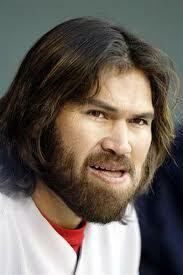 The Johnny Damon signing is all but official according to most sources. It stands as a necessary if desperate move for a club seeking any kind of consistent pop from its power-deficient lineup, last weekend's sandblasting of the Royals' pitching staff notwithstanding. And to think some fans are worried about Damon taking away at-bats from Shelley Duncan. Is that how far our "small market" expectations have fallen? While the journeyman hitter has done an admirable job in left, currently leading the team this young season in both batting average and slugging percentage, he's a prototypical "4-A" guy who's great as a fourth outfielder, not as an everyday starter. That's not to say Damon is the Tribe's John McClane, either. He's not going to burst through a plate-glass window and gun down some Eurotrash terrorists for this struggling offense. His popgun arm has also been much maligned since the signing was announced. We all want a real difference maker on this club, but those guys were snatched up by teams with deeper pockets than the Tribe's. Damon, meanwhile, has been unemployed since the start of spring training. The Indians are giving him a "paltry" $1.25 million to remove him from baseball's bread line, a move very much in line with the lightning-in-a-bottle, fingers-crossed mentality of this front office. Then there's the reported opt-out clause for Damon upon Grady Sizemore’s return from the disabled list sometime in June. With the clause, Damon could become a free agent and sign with another team, even if the Indians don't want him to leave. There's a chance Sizemore could come back and get injured again two days after Damon skips town. Where would the Tribe be then? Where they are now is in a low-risk, medium-reward place with the newest Friend of the Feather. The Damon signing is no blockbuster move, but it's not a lateral one, either. If this is the Tribe's window of contention, then something had to be done to beef up the everyday roster. For now, Damon will have to do.